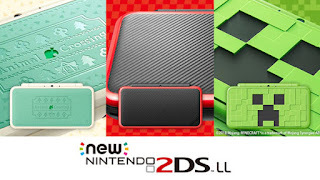 Nintendo has announced that they will be releasing brand new New 2DS XL models in Japan (known as the New 2DS LL in the region). The 3 new models are based on Animal Crossing: New Leaf, Mario Kart 7 and Minecraft. The New 2DS XL Animal Crossing: New Leaf Amiibo+ Pack releases on July 19th for 15,980 yen. The New 2DS XL Mario Kart 7 Pack also releases on July 19th for 15,980 yen. The Minecraft New 2DS XL Creeper Edition doesn’t release until August 2nd, and it will cost 16,980 yen.